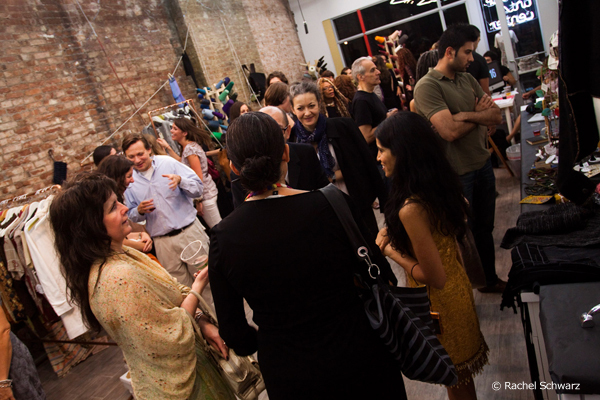 Over 500 people filled the Textile Arts Center's new Manhattan location for (sustainable) Fashion's Night Out... and they just wouldn't leave. What were they waiting for? The goody bags were long gone and we hadn't promised any celebrity entertainment that I was aware of. Guests even stood patiently at the refreshment table with their little cups, politely asking for more. How cute, I know. So how did we keep these people content and calm for so long on a night when the city is called to go carnal for fast fashion? Joe Sundlie of Vintedge getting serious about getting more refreshments. Lots of good looking people. The stories behind the things for sale in the TAC kept everyone engaged. 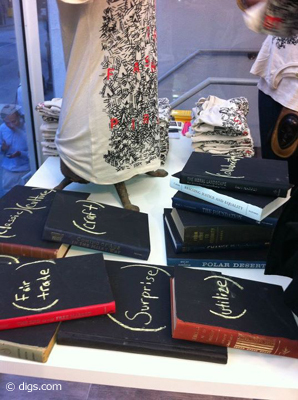 Our designers and retailers were ready to act as the voice for these stories. Monisha, the founder of Love Is Mighty, had just returned from a month-long stay at her production facilities and was proudly talking about what it takes to have a high-end vegan shoe line. Julie and Tom from Mongo amused everyone with their collection of endless possibilities. 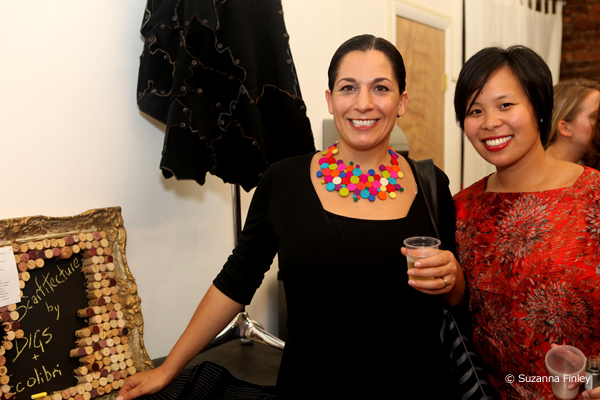 Kaelyn Garcia humbly described her creative process and the values that define her beautiful new collection. Scott from Tompkins Point discussed why fair trade made sense innately and what came after that first step. Branson, the co-founder of Of Rags, talked about the shipping process that had brought our items from Ghana less than 24 hours before the event -- "lots of big machines and a small box." 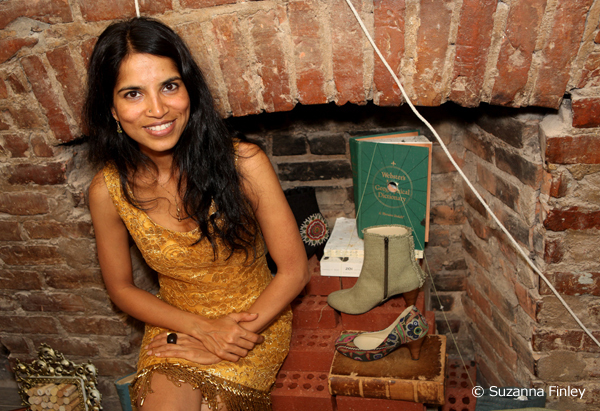 Monisha Raja sits down at the fireplace for some storytelling. We all know storytelling and sustainability are friends, but what really gets the "telling" part started? I believe it's the desire and expectation to discuss "the why." I heard shoppers asking the designers "Why did you choose to make this here? There? With those people? In this fabric? This style? For this price?" And designers were curious back, wondering "Why do you ask? Like it? Want it? Respect it? Pay for it?" It might seem invasive for a consumer to ask the producer such questions face-to-face, but to that end I would like to ask "why?" If we trust each other to assign appropriate value to things then the question of price becomes the most respectable and celebrated question possible. 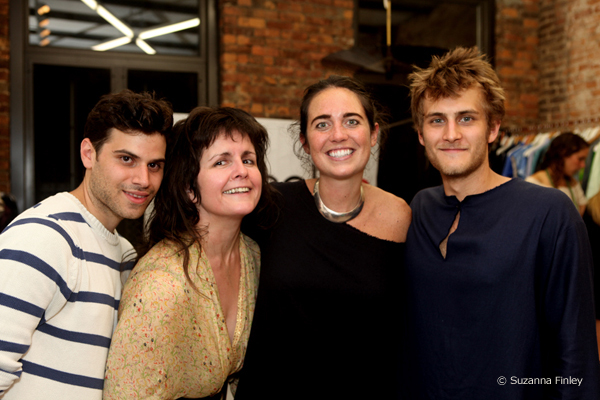 All the designers present that evening take great care in defining the value of their products. They know the names of the people whose lives are waged, the communities where the resources are harvested and the side effects the product will have on us consumers. It's a lot to plan for, so talking about it is exactly what makes it worth it. It was beautiful to be in a room full of people who cared to ask about "the why" and who treated nothing as if it were priceless. The price is in the parenthesis. 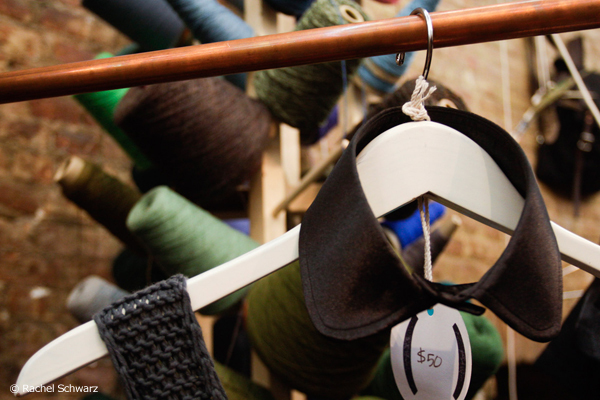 It represents more than a number, especially with this collar made at The Sock Hop and the hand knitted Wool and The Gang tank top on the hanger below. All of the price tags for the evening utilized local materials and were made by hand using recycled card stock from New York based 4over4 and custom stamps from Casey's Rubber Stamps in the East Village. 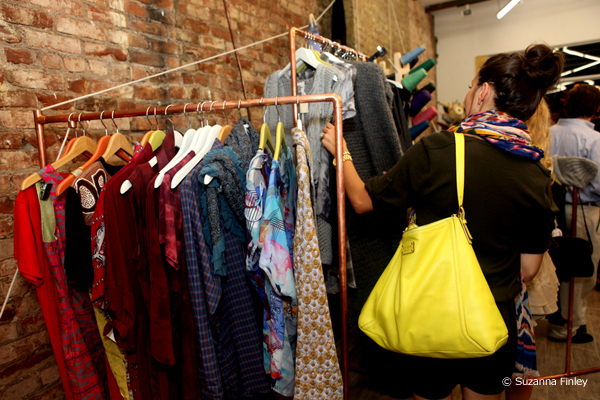 Lots of interaction with the products on the copper racks made for the evening by Branson. We worked hard to create an environment where "the why" was welcome. We envisioned somewhere that felt like playing school with the neighbor kids in your parent's bedroom... in cool clothes, of course. How did we imagine, that you ask? 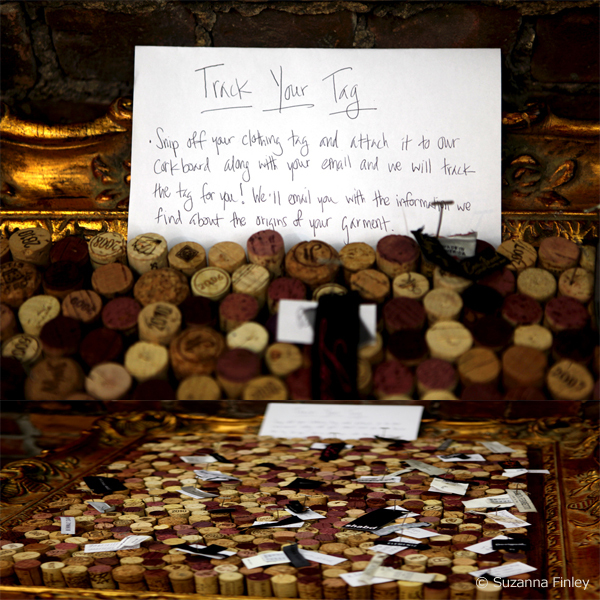 Thanks to East Village restaurant, Hearth, we reused wine corks to make our cork board too cool for school. When we picked up the corks that Hearth collected for us over a month, a member of the waitstaff mentioned how excited she was to save the corks because each one had a little story -- "this one is from that table Thursday who ordered two bottles of Riesling." When Of Rags sat down with our partners, NYC Fair Trade Coalition, EcoSalon and the Textile Arts Center, we decided to put the word "sustainable" in parenthesis to get everyone involved thinking outside the "slow, green-is-black, biodegradable-box-bag, movement-thing" and talk about why they identify with fashion. At Of Rags, Branson and I are always talking about "the why." It is important to be able to defend our roots. We expect that anything fashionable ought to have a positive impact and sometimes those well-intentioned qualifiers can take away from the importance of fashion itself. 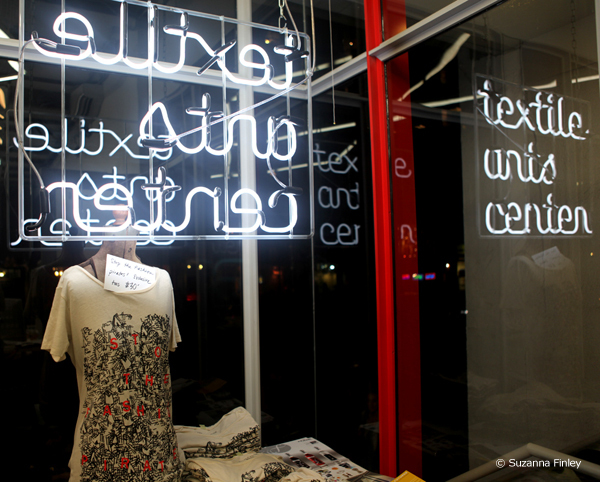 Stop the Fashion Pirates shirts from Feral Childe and EcoSalon. To represent this, we painted the cover of some books from our library with chalkboard paint on which we drew parenthesis. Amy from EcoSalon then wrote the word each designer chose to place inside the parenthesis and a small dedicated message about "the why" on the inside cover. "(Surprise) Fashion," reflected the artistic spirit of designers Alice and Moriah from Feral Childe. "(Personal) Fashion" is designer Julie Diller's term to describe the care she puts into her clothing line OHM and the relationships she shares with her customers. Vince at The Sock Hop thinks about the "utility" and getting the "full life" out of the products he curates. Among other things, The Sock Hop features custom shirts made with family tradition right in their store. 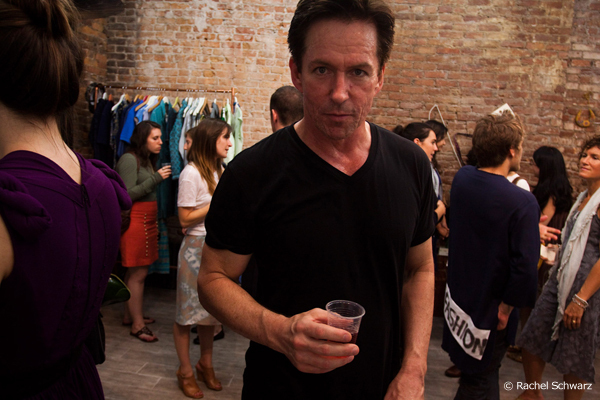 To find out about all of the designers' takes on (sustainable) fashion, please visit sustainablefashionsnightout.com. Writer and friend Joey Merlo with Jacqui Bennet, who wonderfully made the Of Rags uniforms for the night. Branson and I are the other two folks. For me, fashion is "beauty" and beauty is holistic. It may have many labels, but when the stories are told the value of these labels become consumable sustainably.